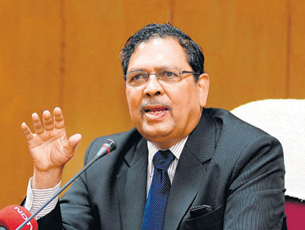 Haveri, July 07, 2015: Justice Santosh Hegde said on Monday that he was feeling embarrassed to call himself a former Lokayukta. He told a press conference in the city that he was now 75 years old and did not want to take up any government assignment in future. Hegde said that he foresaw legal, technical difficulties if efforts were made to remove Lokayukta Justice Bhaskar Rao - embroiled in a controversy over graft in the anti-corruption watchdog. The former Supreme Court judge said that it would have been proper for Justice Rao to either go on leave or resign, but he was complicating matters. Justice Hegde favoured a CBI inquiry into the whole episode. Justice Rao had disowned his son when activist S R Hiremath had, in March, brought to his notice the dealings in the institution that his son was involved in. Now, Justice Rao claims that his son is innocent, Justice Hegde said. There seems to be no morality in the functioning of the Lokayukta and he is working in a blatant manner, Justice Hegde said. There is a different statement each day regarding the CCTV cameras at the office of the ombudsman, he said, adding that there were fears of files going missing there. Justice Hegde regretted the fact that the Lokayukta had turned into a rehabilitation post for retired judges.